In 2013, there were more than 2.2 million injectable filler procedures, which makes fillers the second most popular nonsurgical cosmetic procedure, and the fastest growing. Do you love the more youthful look that dermal fillers provide, but wish the results weren’t so temporary? Bellafill lasts through 5 years. 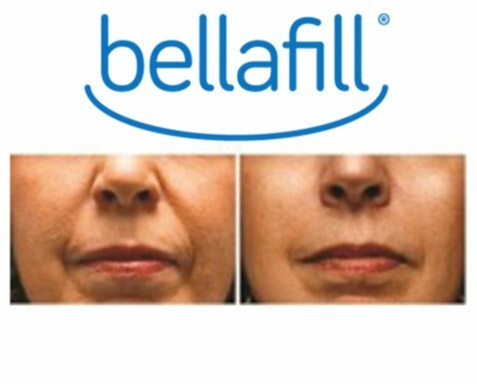 Bellafill is a unique, injectable collagen filler with microspheres that can instantly smooth facial wrinkles (nasolabial folds) for beautiful, natural-looking correction that lasts years instead of months. Wrinkles caused by volume loss and gravity: Over time, we lose volume in our faces, increasing the chances for wrinkles and folds to appear. 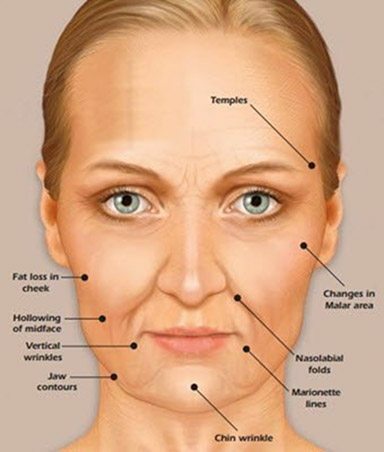 The fat pads in our cheeks may slide downward toward the mouth, which can cause the skin to wrinkle or fold, creating the “smile lines” from your nose to the corners of your mouth (nasolabial folds). Bellafill effectively addresses volume loss to reverse the signs of aging. Wrinkles caused by repetitive movement: Repeated movement of the facial skin may create wrinkles. These types of wrinkles are “dynamic.” Age is a factor, but repeated facial movements, such as frowning or squinting, can also create lines, which means they may develop even in younger adults. These wrinkles are not candidates for Bellafill treatment. Immediate correction and lasting improvement with visible benefits through 5 years for wrinkles known as smile lines. Satisfied Patients. In a consumer survey, 91% of patients were likely to recommend Bellafill. 2 In a 5 Year Post Approval Study, 83% of patients were satisfied to very satisfied with their nasolabial fold correction at the end of 5 years. PMMA helps replace lost collagen by working with your body’s natural processes. Can be used for distentible acne scars. Simple, in-office treatment with little to no downtime. You can immediately resume normal activities. Bellafill was proven safe in the longest and largest prospective dermal filler study ever completed. Biocompatible PMMA. The microspheres in Bellafill are made of PMMA (polymethylmethacrylate), a biocompatible material that has been used in medical implants for 65 years. What is Bellafill and how is it unique? Bellafill replaces lost volume in the skin below the wrinkle for results that are immediate and lasting. The injectable gel is comprised of 80% purified collagen gel and 20% PMMA (polymethylmethacrylate) microspheres. Bellafill keeps on working Bellafill is different. It restores rather than just fills for natural, enduring results. In a clinical study, satisfaction and effectiveness were established through 5 years. The collagen gel in Bellafill provides immediate volume and lift. Over time, the collagen gel is absorbed by the body. The PMMA microspheres remain in place and create a matrix that supports production of the body’s own collagen for lasting correction. The microspheres in Bellafill are half the diameter of a human hair, so small that they are virtually invisible to the eye. The microspheres are made of polymethylmethacrylate (PMMA), one of the most widely used materials in medicine for 65 years.